Good Morning Everyone- This morning I have the pleasure with speaking with E D Brady. She is the author of several books. One of which is REMEMBERED ( THE VISTRIA TRILOGY BOOK 1) Please lets all give her a Big mouse welcome !! Good morning Ms. Brady and Thank you for Joining us today here on mousey It is a pleasure to have you here with us today. I see from reading your bio that you are originally from Queens , New York. That is a very lovely area of New York. You now live in Raleigh.You are a wife an mother of 3 ( which includes your little fur baby). How do you find the time to write ?? Ms Brady:I mainly write during the day when the kids are at school. Now that they’re older, it doesn’t really matter as much. They are pretty good at doing their own thing most of the time. Who and what inspired you to write an at when did you know that you wanted to be a writer?? In Vistria Trilogy with starting with Remembered – did you base any of your characters off of any one? Ms. Brady: Most of my characters are strictly my imagination except one: Catherine (Cappy). She is 100% based on my best friend. We have been friends since we were 10-yrs-old. My bff loves big, big muscles and can be quite the flirt. How did you come up with writing this story and trilogy?? And do you have any favorite characters in Remembered? Ms. Brady: Remembered just sort of came to me out of nowhere. I had no intentions of writing at the time, but the story kept nagging at me. After I finished that, Reclaimed came naturally right away and I was finished with that story, or so I thought. One morning, I just woke up thinking “What if this were to happen four years from where I left off”, so I went with what was forming in my head and Returned was born. Ms Brady: I never outline a book. I don’t write until I have something already running in my mind. I find if I have an idea and just start to type, the story seems to just flow. I’ve never experienced writers block because I’m never under a deadline, so I just type what flows. Sometimes, I do have to go back and edit out whole chapters because they’re not important to the story. I only listen to music when I’m trying to get into a certain deep emotional mood. How can your readers contact your ?? Ms Brady: Readers can contact me directly at my email edbrady@live.com or on facebook: facebook/edbradyvistira. Do you have any new books in the works that you can tell us about?? Ms Brady: I have also written a fantasy romance about immortals called Discovered. And I have a novel called Craving Shannon that was written for a mature audience only. Craving Shannon is a contemporary romance.Is there anything else that you would like to tell your readers ?? 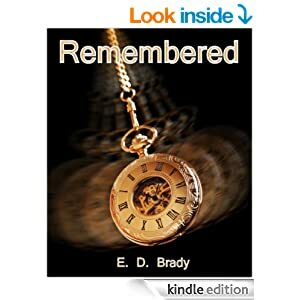 When Emily seeks professional help to deal with haunting dreams of a handsome stranger, she is thrown into horrifying memories of being kidnapped and almost murdered. She embarks on an astonishing journey where she uncovers her true identity and is reunited with the only man she will ever love. But the evil that tore them apart still lurks, threatening to destroy their love and more than likely end their lives. ← TATTOOED HEARTS COVER REVEAL BY MIKA JOLIE A MUST READ BK3 IN MARTHA’S WAY SERIES!! !